With the economy what it is and everyone trying to get as much bang for their buck as possible, I’m finding that online training for your CAD software programs is an increasingly popular and cost effective option. Although this post describes my personal approach and may be different considering your trainer, hopefully it will answer some of your questions about online training and will encourage you to give it a try. There are several online services that trainers may use for online training. WebEx, GoToMeeting and GoToWebinar are all very commonly used and popular. My preference is GoToMeeting and GoToWebinar as they have a very low footprint on your computer and are simple to use. When first entering an online meeting, a small installation of the program occurs allowing you to view and interact with the presenter’s computer. GoToMeeting is smaller scale and better for personalized training. GoToWebinar can handle up to 1,000 “attendees” and is typically used for presentation or demonstration to a large group. Some of the online meeting services are free, but most require a monthly fee. The fee is paid by the organizer who then has the ability to schedule meetings/webinars in advance or “Meet Now” for meetings on the fly. Your organizer will either email you a link to the meeting site or can tell you the link on the phone. Each meeting has a unique “Meeting ID” that you will enter at the main page. GoToMeeting is typically used for standard training where more than one person may need to show their screen and/or be given control of the mouse and keyboard. This interaction can take place in a variety of ways. When in a meeting, anyone can be given (and must accept) the “Presenter” role which allows others to view their computer. And, even though the Presenter always has priority, control of the mouse movement and keyboard entry may be granted to others in the meeting. This allows someone else to work on my computer remotely. The audio portion of the training usually takes place by calling in on a conference call line supplied by GoToMeeting. VOIP (Voice Over Internet Protocol) is also available allowing you to use your computer’s speakers and microphone but it is not recommended because of quality. GoToWebinar is used for larger scale demonstration and presentations and can accommodate up to 1,000 Attendees. Online Webinars are generally structured to have one or more Presenters making the presentation. Like GoToMeeting, the audio portion of GoToWebinar usually takes place by calling in on a conference call line supplied by GoToWebinar. However, in a Webinar setting, the Attendees are muted automatically by the Presenter so that everyone isn’t blessed with the sound of crinkling potato chip bags and elevator music when someone puts the call on hold! The Presenter has the ability to un-mute one or more Attendees as needed. The audio of all Attendees is managed by the Presenter by having each Attendee enter a unique “Audio PIN” upon arrival. 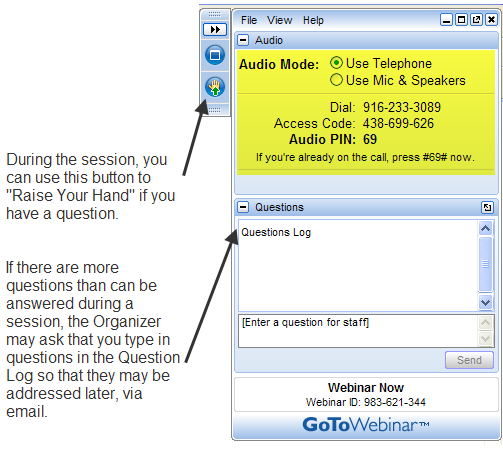 GoToWebinar has 2 ways to ask and respond to questions from Attendees. The Control Panel has a “Raise Your Hand” button that notifies the Presenter there is a question. Depending on time constraints, the Presenter may decide to un-mute and answer the question during the online session. If there are more questions than can be answered during a session, the Organizer may ask that you type in questions in the “Questions Log” so that they may be addressed at a later time. I’ve put together what I consider to be the Pros and Cons of online training for CAD Software programs. Allows for personalized, absolutely customized training because it’s normally one on one. Can’t find a local trainer? No problem. Felicia Provencal can train you from Hawai’i – although you may want to go to her! Can be set up within minutes if there is a pressing technical support issue or project that suddenly comes up. Can be scheduled in shorter blocks of time – one of the best ways to make sure you retain what you are taught. I like to schedule 2 hours maximum per session. Shorter blocks of time allow for easy customization of training topics from one session to the next. If more time is needed on certain features, it’s easy to squeeze in another 2 hour session. It’s less interactive than hands-on, in person training. For hands on training and depending on the material being covered, it may not work as well if you have several folks needing training at one time. Requires a high-speed connection and a telephone headset allowing two hands on keyboard. A speakerphone can be used as long as feedback doesn’t become an issue. I recently worked with a client from out of state. He is a grading contractor who thought he needed Carlson TakeOff training but, after some discussion, realized training in basic CAD (IntelliCAD) needed to come first and then TakeOff training. The initial proposal was for me to travel there and spend 3-4 days training this client plus a second person (a competitor, in this case) who needed the same training. Both of them decided to give online training a try. We scheduled online training for every morning one week. I worked with one from 7:30 to 9:30 am and then with the other from 10:30 – 12:30 pm. After the 3rd day, we had covered so much material that one asked to skip the next day so he could work with it himself and apply what he’d learned so far. We ended up skipping two days. By the time we met again, he’d worked with it enough and become so much more proficient with the basic CAD operation that we were able to fast-forward through the next couple sessions and started working on his current project. Another subsequent session was cancelled because the rain finally stopped! And then a few days later, he needed to get his project finished and out to bid. So, after our first session one morning, we set up another session at 4:00 that afternoon and worked until almost 7:00 that evening. Both customers ended up very happy with the amount of material we covered and where they were with the software when we wrapped up our regular training. They still have the video recordings of the training for their reference to go back to when needed. In the end, the cost was almost the exact same as it would have been had I fulfilled the original proposal but they both learned and retained much more because the training was customized and personalized to their specific jobs. If you’d like to discuss online training for yourself or your group, please call 919.417.8351 or email us at ContactUs@thatcadgirl.com.